Did Earth's Water Come from Space? There are millions of asteroids in the asteroid belt between Mars and Jupiter, but yesterday attention focused on just one. According to a couple of studies in Nature, a large asteroid called 24 Themis is rife with water ice and organic molecules, and the researchers say that it could be more evidence that the water so precious to life on Earth came to our planet on board such rocks. 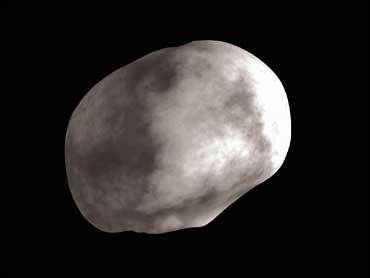 Two research teams took infrared images of 24 Themis, which is about 120 miles in diameter and was discovered in 1853. This asteroid has an extensive but thin frosty coating. It is likely replenished by an extensive reservoir of frozen water deep inside rock once thought to be dry and desolate. It might seem implausible that our planet's water supply arrived incrementally as cargo on board comets or asteroids. But here's how it may have happened: More than four billion years ago, after a massive collision between Earth and another large object created the moon, our planet was completely dessicated. Then, during the Late Heavy Bombardment period that followed, during which lots of asteroids hit Earth, the ice that the objects carried became our store of water. Science News: Ice Confirmed on Asteroid:"
The bombardment period, which occurred nearly 4 billion years ago, was largely responsible for our moon's puckered appearance. A 2005 Nature study estimated that between 3 and 8 zettagrams of material slammed into the moon during that time (zetta means 10 to the 21st power, or a billion times a trillion), which implies that plenty of rocks slammed into the Earth, too. Asteroids just keep getting more interesting. As we noted on Monday, the Japanese spacecraft that was the first to touch down on an asteroid is limping home to Earth, hoping to return its results to the home world by June. And President Obama's revised space exploration plan includes the idea for astronauts to visit an asteroid-a possibility that's all the more scientifically enticing if they were the bringers of our water.